Nightcaller Temple is a ruin located on the clifftop overlooking Dawnstar. Also known as the Tower of Dawn by some locals, Nightcaller Temple is a ruin within a ruin. Originally it was a military fort, but after it was abandoned it was occupied by the worshippers of Vaermina. Some time after they occupied the tower an Orc war party attacked, intending to destroy the Skull of Corruption which had inflicted them with terrible nightmares and lack of sleep. Unable to fend off the Orcs, in a last ditch effort to protect the skull, the worshippers released the Miasma, a gas that put everybody inside to sleep, and the temple fell into ruin once more. † They move here at the conclusion of the related quest depending on your choices. The entrance is guarded by three leveled animals. There are several snowberry bushes in and around the building. It is possible to climb the ruined wall to the right of the entrance, from here you can jump on top of the ground floor level and walk around to the north side, where you will find an unlocked wooden chest. On the west of the building, against the outer wall is a moonstone ore vein. The entrance leads directly into the entry hall, where Erandur has established a makeshift shrine of Mara on the left-hand wall. There is a copy of Trials of St. Alessia in front. Prior to the start of the related quest there are two skeevers in this room. A lectern at the back of the room holds three common books, with a novice locked chest against the wall behind it. You are unable to explore past this first room until you start the related quest. 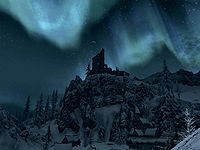 Speaking to Erandur, a follower of Mara, in the Windpeak Inn in Dawnstar will begin the Waking Nightmare quest to end the nightmares, which is centered around this location and its questionable past. There is a strange, almost mechanical noise coming from the back of the temple, near to the large central wall carving. After Erandur unlocks the carving, it will become a shadowy curtain leading into the tower. In the middle of the tower lies the skull of corruption, a powerful daedric artifact which feeds on the dreams of its victims. The ruins obviously haven't been entered in a long time judging from the dust and cobwebs. There are many crates and barrels found within the ruins. There are many Orcish invaders and Vaermina devotees throughout the ruin, how many revive depends on your level; any that do will be instantly hostile to both you and Erandur. When you first enter with Erandur, he will lead you around until you can look through some grating down upon the Skull of Corruption. You can also see the magical barrier blocking access to it and most of the ruins. You pass a wooden door that is locked and requires a key to open. Descending the stairs as they curve around until you reach the barrier. There are two invaders at the bottom of the stairs and a raised wooden grate blocking a passage to the northwest. After a brief conversation with Erandur he will lead you back upstairs to the locked wooden door, which he will now unlock. Through the door is a short passage leading to the library, where you will find an invader and devotee upstairs and two more devotees and another invader downstairs. Once any that revive have been dealt with, Erandur will instruct you to find The Dreamstride a book that contains the information needed to pass the magical barrier. Most of the books in the library have been burnt and are worthless, however in addition to the book you are looking for these: 16 Accords of Madness, v. VI, Biography of Barenziah, v2, Feyfolken II, On Oblivion, The Book of Daedra, The Firmament, Varieties of Daedra can also be found. Downstairs, against the northeast wall is a wooden door with an expert locked chest behind it. Once you return with the book to Erandur he will then lead you along a passage to the northwest towards a laboratory where he hopes to find a potion known as Vaermina's Torpor, a potion that will enable you to enter the dreamstride state and pass the magical barrier. The passage leads into a storeroom that contains an invader and devotee. There are numerous unusable barrels, sacks of foodstuffs, two sets of shelves holding a total of six bottles of Nord mead, two bottles of alto wine, nine bottles of wine and a few empty wine bottles. Against the northeast wall is a small unit holding a nightshade flower, a chaurus egg and a bulb of garlic. Beside this is a barrel containing ingredients. On the floor are two large pieces of charcoal, a piece of leather and a leather strip. In the western corner is a passage into the laboratory. Here you will find two devotees and an invader on the left and a further devotee and invader on a lower level. Once they are taken care of, Erandur will explain what the torpor looks like. 1 Blue Butterfly Wing, 4 Butterfly Wing, 1 Canis Root, 1 Chaurus Eggs, 2 Daedra Heart, 1 Dragon's Tongue, 4 Elves Ear, 2 Falmer Ear, 3 Fire Salts, 2 Frost Mirriam, 1 Garlic, 2 Giant's Toe, 1 Glow Dust, 3 Hagraven Feathers, 3 Ice Wraith Teeth, 1 Jazbay Grapes, 4 Luna Moth Wing, 2 Nightshade, 4 Nordic Barnacle, 1 Rock Warbler Egg, 1 Salt Pile, 4 Scaly Pholiota, 4 Skeever Tail, 2 Slaughterfish Scales, 2 Taproot, 2 Troll Fat, 4 Tundra Cotton, 2 Vampire Dust, 1 Void Salts. 1 Random Potion of Healing, 2 Potion of Minor Healing, 2 Potion of Minor Magicka, 2 Potion of Minor Stamina, 1 Potion of Resist Fire, 4 Potion of Resist Shock, 1 Vaermina's Torpor. 7 Alto Wine, 1 Carrot, 1 Dog Meat, 1 Horker Meat, 2 Nord Mead, 6 Wine. 2 Apothecary's Satchel, A copy of the Alchemy skill book Mannimarco, King of Worms, a copy of The Book of Daedra. To the southeast from the lower level is a wide passage. On your immediate right, on the ground is a large coin purse. The passage leads to the wooden grate that was blocking access to/from the main passage next to the magical barrier. On the left is a handle that lowers it. Once you return to Erandur with the torpor he will instruct you to drink it. Drinking the torpor will cause you to enter the dreamstride state and you will have to navigate the passages and rooms to re-enact when the miasma was originally released and the magical barrier created. Once you have done this you will then be in position to take the random soul gem that is maintaining the barrier, thus removing it and allowing access to the rest of the ruins. You will now have to battle alongside Erandur back through the rooms and passages you traveled in the dreamstride state to reach the Skull of Corruption. The path is totally linear, with more and more devotees and invaders as you go. You will pass an alcove on your right that contains a wooden table with an arcane enchanter built-in to it. On the table is a leveled potion of healing, a leveled potion of magicka, a random potion, and an empty random soul gem. Against the south wall is an unlocked chest. Shortly past this an alcove on the left has a tall wardrobe containing clothes, next there is a set of shelves on the right holding two bottles of wine and a couple of empty wine bottles. The passage turns north and ends with a wooden door on your right. Through this is a dormitory with four single unowned beds and two dressers, one of which has a set of Vaermina robes on top. Against the east wall is an unlocked chest. On the left there is a flight of stairs leading down to many more unowned single beds. There are two dressers containing a mix of common and fine clothes, a cupboard containing clutter and in the corners there are piles of food sacks. Beside the stairs is an adept locked chest with a long wooden table next to it. On this table is a leveled potion of healing, a leveled potion of magicka, an iron dagger, a small coin purse and three loose septims. To the west is a narrow passage leading to a dining room containing several long wooden tables and benches with a total of six bottles of alto wine on top of them. Around the room are several sets of shelves and sideboards holding a selection of bottles of alto wine and wine, a random helmet, two random potions of healing and one random potion of stamina. From here the passage continues to the north heading west, on the left is a small unit holding two fragments of soul gems, two bottles of alto wine and a bottle of Nord mead. At the end a wooden door opens into the room with a flight of stairs up to the Skull of Corruption at the far end. When you first enter, a cut scene will play where Erandur is greeted as "Brother Casimir" by two Vaermina Devotees, Veren Duleri and Thorek (the two devotees conversing at the start of your Dreamwalk), revealing him to be the person who initially released the miasma and whose memory you used to travel past the barrier. In this room apart from the Skull of Corrruption there is an unlocked chest to the right of the platform where the staff is held. Apart from this there are two small units with a couple of bottles of Nord mead among several empty wine bottles. You are unable to take a follower into the fort with you, if you are traveling with one they will stand by the entrance awaiting your return. An interior map of Nightcaller Temple. This page was last modified on 13 January 2019, at 11:52.